From about 3.45pm, lantern bearers gather outside the Gables Hotel at the bottom of Compston Road, where the Fire Marshals will get everyone's lantern lit. Santa arrives to head the procession which leaves at 4.30pm, all lanterns burning. Off we go up Compston Road with Father Christmas switching the lights on and weaving a spell with his magic dust as we parade around the village. Scheduled stops are at Millans Park junction, outside Boots chemist, and then round to Market Cross. 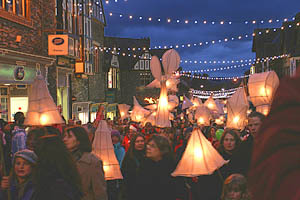 The Parade continues around the village via Market Place, Lake Road as far as Church Street junction and then down Church Street until all the lights are switched on and Ambleside is transformed into a Magical Winter Wonderland.